Hooded crows fly around in groups; they are curious, check objects in their flight path and also inspect summertime crow nests. 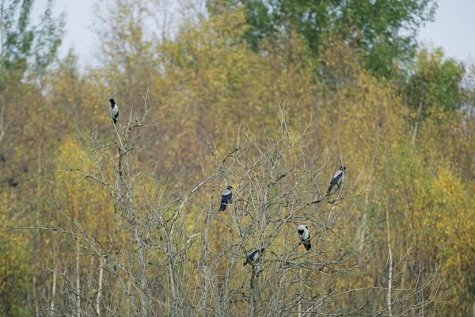 Most of the birds that nested here have migrated towards south and the crowd visible now have arrived from north and east in the hope of a milder winter. The crow community varies; winter numbers are up to five or six times higher than the nesters, and may amount to three hundred thousand birds. Outside the breeding period they are social birds, moving in groups, staying in cities and communities, often together with jackdaws. We can see them almost everywhere and they know how to utilise waste left by people or animals caught under car wheels. Once a crow has found an eatable object its comrades very soon know it too. How can it happen so fast? The crow has an ash grey back, belly and underwings. Black-coloured head, chest, wings and tail. Legs and beak also black. Regarding eye colour the eyes of young birds still seem greyish, but the eyes of the adults look black. And when crows open their beak a red mouth becomes visible.